^ A. Chaston Chapman (22 Mar 2012). Brewing. Cambridge University Press. pp. 51–54. ISBN 9781107605954. ^ John Palmer. "Single Temperature Infusion". How to Brew. Retrieved 2018-09-20. ^ Chad Michael Yakobson (9 Sep 2011). The Oxford Companion to Beer. Oxford University Press. p. 540. ISBN 9780195367133. ^ Peter Mathias (1 Jan 1990). 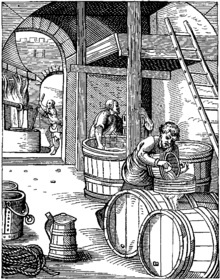 The Brewing Industry: A Guide to Historical Records. Manchester University Press. p. 23. ISBN 9780719030321. ^ Paul Buttrick (9 Sep 2011). The Oxford Companion to Beer. Oxford University Press. p. 453. ISBN 9780199912100. ^ a b Anders Brinch Kissmeyer; Garrett Oliver (9 Sep 2011). 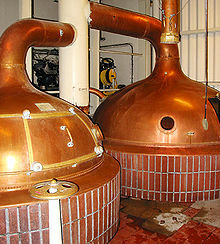 "Fermentation vessels". The Oxford Companion to Beer. Oxford University Press. pp. 347–351. ^ a b Chris Boulton; David Quain (25 Apr 2013). 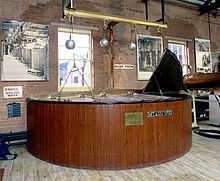 Brewing Yeast and Fermentation. John Wiley & Sons. p. 294. ISBN 9781118685341. ^ Charles W. Bamforth; Chris White (9 Sep 2011). The Oxford Companion to Beer. Oxford University Press. p. 331. ISBN 9780199912100. ^ Chris White, Jamil Zainasheff (1 Feb 2010). Yeast: The Practical Guide to Beer Fermentation. Brewers Publications. p. 94. ISBN 9781938469060. ^ Terry Foster (7 Apr 1999). Pale Ale. 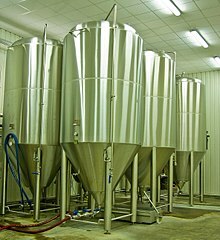 Brewers Publications. p. 185. ISBN 9781938469251. ^ Gregory J. Noonan (17 Sep 2003). New Brewing Lager Beer. Brewers Publications. p. xxi. ISBN 9781938469237. ^ Sandra Rainieri (28 Apr 2011). "8 The Brewer's Yeast Genome". 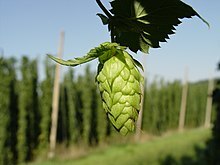 Beer in Health and Disease Prevention. Academic Press. p. 89. ^ Chris White (9 Sep 2011). The Oxford Companion to Beer. Oxford University Press. p. 331. ISBN 9780195367133. ^ Pogaku Ravindra (13 Aug 2015). Advances in Bioprocess Technology. Springer. p. 428. ISBN 9783319179155. ^ Medeni Maskan, Aylin Altan (19 Apr 2016). Advances in Food Extrusion Technology. CRC Press. p. 130. ISBN 9781439815212. ^ A.H. El Boushy (17 Apr 2013). Poultry Feed from Waste. Springer Science & Business Media. p. 300. ISBN 9789401717502.